I know it may be dumb but one of my favourite things about Steven Universe character redemption ideas for the homeworld gems is how their uniform will change in design. I got the idea that upon redesign, Peridot's technological parts could change shape for a unique new appearance while still keeping their capabilities of being amputatable. 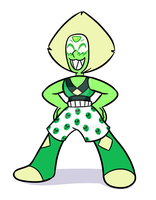 I also felt a more dynamic look would show the growth in Peridot in gaining strength and learning to fight for herself.